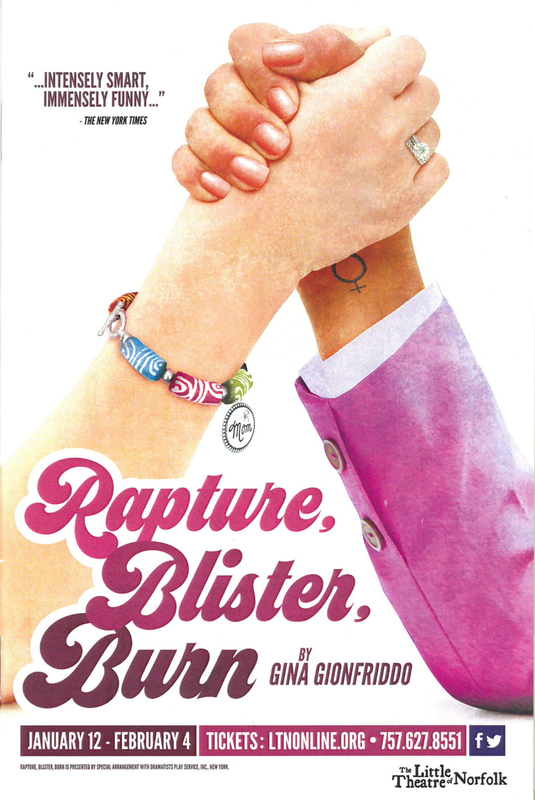 Theatre and Women’s and Gender Studies professor, Dr. Sally Shedd performs in a local theater performance of “Rapture Blister, Burn” by Gina Gionfriddo. A tinny broadcast of “I Am Woman Hear me Roar” fades away as the lights come up on a tense gathering of characters. Two women, instantly recognizable as being of different walks of life, sandwich a floundering man between them, foreshadowing the greater scope of the plot. This opening moment of The Little Theatre of Norfolk’s Rapture, Blister, Burn, written by Gina Gionfriddo and directed by Cindy Shea introduces the protagonist, Cathy portrayed by Virginia Wesleyan University’s own Dr. Sally Shedd, professor of Theatre and Women and Gender Studies. Dr. Shedd’s background is fitting to the character of Cathy, a feminist scholar and author, who has lived a glamorous city life and is returning home to her small town to care for her aging mother. Dr. Shedd performed an authentic professor, similar to her work on campus, but with a raunch twist and a darker outlook on life. While it may be second-nature for Dr. Shedd to portray a professor, her student sees the distinction between the real life and the fictional. For the Virginia Wesleyan audience, perspectives of the professor, the traditional student and the non-traditional adult student are all given equal weight and examination. Gwen, the housewife and mother, but eager student, has the life experience to back up her claims and ideas. Though she and Cathy are at odds in their personal life, Gwen is able to leverage her life experience in favor of theoretical ideas that Cathy doesn’t give equal weight. A traditional student might most relate to the character of Avery, played by Norfolk native a witty and frank 20-something who experiences life and college with a millenial attitude. Senior Christine Megia, who went to see the piece as a part of her winter session Theatre class said that she was split between the generational ideas presented, not quite aligning with one perspective. “I grew up on my mother’s ideas of feminism, but am starting to build my own perspective,” Megia said. To fully appreciate the work she “sat back and tried to push my biases out of the way”. A non-traditional or mature student may experience and relate to the piece through Dr. Shedd’s portrayal of Cathy, or through the adult student and opposing character Gwen. Representing different perspectives and different paths in life is familiar VWU students.These women work and argue Gilmore Girls style through an examination of wisdom, motherhood, career girl prospects. The playwright effectively gives each perspective on life an equal and fair weight, and the director reinforced that with sympathetic portrayals of each of the women. Leading by example, and showing real life experiences can be the greatest teacher, which is why it is so important that plays like Rapture, Blister, Burn become more prolific in the community, and these themes find their way more often into mainstream media. Megia said that she “learned more sitting in that play, in the 2 hours, about feminism than in 4 years at Wesleyan”. Not everyone can be benefited by the classroom setting, and as multimedia teaching and technology advances, the attention span of the average student is shortened. It is no secret that films and plays are great teachers, people are gain valuable perspective and new ideas of community from characters they see living other lives than their own. A modern American teenager may never know the life of a 16th century slave, or a 40-something businessman may never have had the same experiences as a 25 year-old veteran, but through film and plays they can see how “the other half” lives. The Little Theatre of Norfolk, and director Cindy Shea successfully produced a heart-warming show that fits exactly within the niche of community theatre. Bringing together multiple generations of women to explore what it means to be happy and fulfilled, and how adopting a feminist point of view can change a life for the better is a message that is familiar, especially with the advent of the TimesUp and #MeToo.